The latest research from EnergyTrend, a division of TrendForce, finds the shipments of Chinese branded smartphones have risen sharply in the past four years, with the 2015 shipments expected to grow by 11.6% year on year. Set against the previous year’s growth rate of 20%, this year’s projected shipment result is much less impressive even though it still reflects steady growth. Moreover, Chinese brands now controls a nearly 40% share of the global smartphone market, and their rise causes a corresponding shift in the sourcing of components, including batteries. Previously, the mainstream suppliers for handset batteries are from Japan and South Korea, but now the primary suppliers are Chinese companies and the Koreans assume the supporting position. Japanese cell makers in contrast focus on developing the power battery application. Chinese brand manufacturers of handset batteries thus have gradually reached the top tier of the supply chain by riding on the growth of domestic smartphone brands. 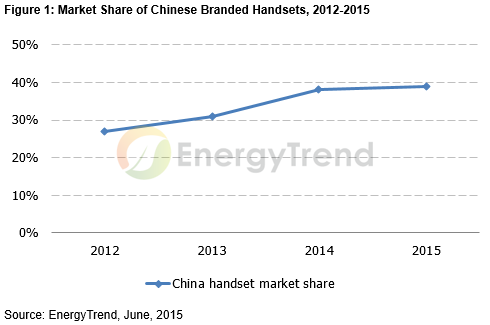 Currently, Chinese lithium cell makers control over 60% of the home market for handset batteries. “The rise of Chinese smartphone brands began when they built themselves up in the domestic market a few years ago,” said EnergyTrend’s Research Manager Duff Lu. “Once they were strong enough they expanded internationally, also taking opportunities to introduce Chinese made components at the same time.” Chinese branded lithium batteries benefitted greatly from this arrangement in terms of the market visibility and have seen rapid growth in their market shares in recent years. Recognized China-based suppliers of handset batteries for global smartphone brands include Amperex Technology, Lision Technology, Shenzhen Desay Battery Technology, Sunwoda Electronic and Coslight Technology International Group. These companies have established themselves as top tier suppliers in the international lithium battery market. Before this wave of handset-driven growth, Chinese lithium battery makers had a short boom period during 2008-2010, when they entered the global supply chain via the notebook application market. At that time, the lithium battery market was rocked by reports of accidents that stirred doubts about the safety of lithium cell products. The bad news also created a supply shortage that Japanese and South Korean battery manufacturers were unable to alleviate. Their Chinese competitors tried to use the situation to propel themselves internationally and all together rushed into the notebook market. However, the South Korean manufacturers made an unexpectedly quick recovery and were able to steadily pushed Chinese-made lithium cells for notebooks out competition in less than a year with well-honed price manipulation tactics. 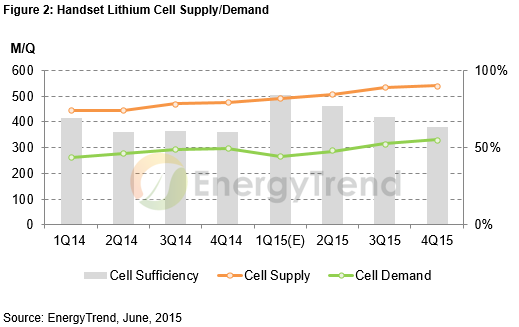 Therefore, the most pressing issue for Chinese lithium cell makers this time around is to seize the opportunities that come from their enlarged presence in the handset battery market and extend their gains.